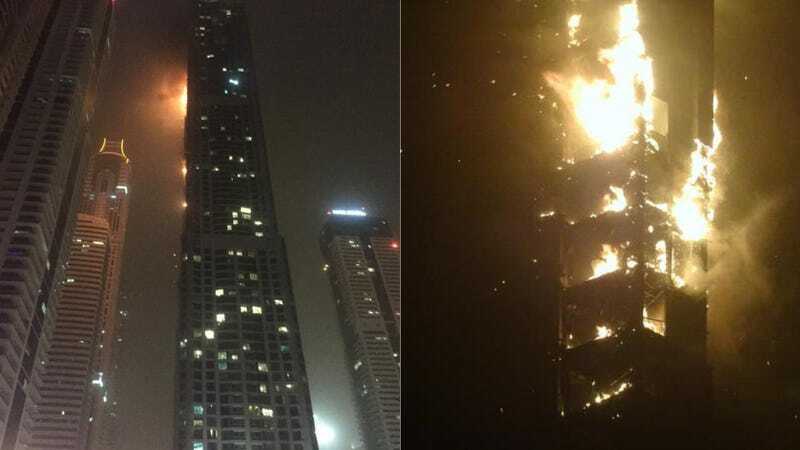 Just an hour or so ago, one of the tallest residential towers in the world, the 79-story Marina Torch Tower in Dubai, made good on its namesake and burst into flames. So far, over 20 floors seem to have been affected. Apparently, fire alarms themselves are nothing new to Torch Tower, although this is one of the first times their use has been merited. Gulf News spoke with a resident, who claimed that "this building has been plagued since opening with false fire alarms on an almost daily basis. I personally had threaten to call the civil defense on many occasions..."
Users have been posting pictures of the disaster on Twitter and Instagram in droves. And thankfully, there have yet to be any reported injuries. Though, several people are being treated for smoke inhalation. While emergency crews arrived on the scene relatively quickly, a sandstorm reportedly helped to make the situation worse, with the biggest threat ultimately being the falling, molten glass. Two of the tower's residents explained to the AP that "flaming material falling from the initial fire then set a lower part of the building ablaze." The fire now appears to be under control, though we'll update as more information becomes available.